I LOVE A PARADE! And brass bands with shiny instruments gleaming in the sun! One red faced plump kid struggling to keep marching and blowing his gigantic tuba! Sweet memories of Macy's Thanksgiving Day, the Tournament of Roses. and just local Fourth of July! High school brass bands are still highly competitive but somehow they don't liven up a parade they way they used to. They play songs I seldom recognize and have fallen back to whatever that little marching ditty they play is by the time they get to where I am. Ok I'm OLD but I like the lively marches that lift your spirits and make your feet want to move! (Well, plus a little Hawaii Five-O and Wipeout!) So all that got me to thinking about the man who really knew how to write a great brass band song! 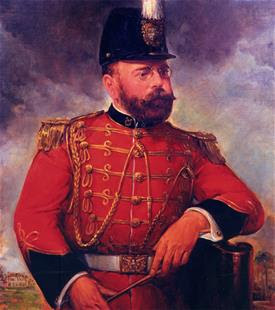 John Phillip Sousa was born November 6, 1854 in Washington, D.C. near the Marine barracks. His father Antonio Sousa was a musician in the Marine Band. Young John went to grammar school in Washington and studied music at a private conservatory of music operated by John Esputa, Jr. He learned to play piano and most of the orchestral instruments but his first love was the violin. He became so proficient on the violin that at age 13 he was offered a job with a circus band. His father would have none of that and enlisted him as an apprentice musician in the Marine Band. There he remained until he was 20. He also studied music theory and composition with George F. Benkert, a well-known Washington orchestra leader and teacher. After being discharged from the Marines, he played the violin, conducted, and toured with several traveling theater orchestras. He decided to move to Philadelphia in 1876 where he worked as a composer, arranger, and proofreader for publishing houses. He joined an operetta company that was producing a musical called OUR FLIRTATION. He wrote the incidental music and the march for that show. Sousa got married in December of 1879 to Jane van Middlesworth Bellis. They went on to have three children John Phillip, Jr., Jane, and Helen. On October 1, 1880, he became the 17th leader of the Marine Band in Washington. This was his first experience conducting a military band and his approach was much different than that of his predecessors. He replaced much of the music in their library and changed the instrumentation to suit his needs. Sousa conducted strict rehearsals and soon shaped his musicians into the country's finest military band. The band's fame spread and soon they were attracting large audiences. He led the band under five presidents from Rutherford B. Hayes to Benjamin Harrison. He played at the Inaugural Balls of James A. Garfield in 1881 and Benjamin Harrison in 1889. During that time he wrote he wrote such songs as THE GLADIATOR MARCH, SEMPER FIDELIS (which became the official March of the United States Marine Corps), and THE THUNDERER. In 1893 he wrote THE LIBERTY BELL MARCH which was later used as the credits theme for MONTY PYTHON'S FLYING CIRCUS TV show! His composition THE WASHINGTON POST MARCH became the most popular tune in America and Europe thus earning him the title the MARCH KING. Under his leadership, the Marine Band made it's first recordings. 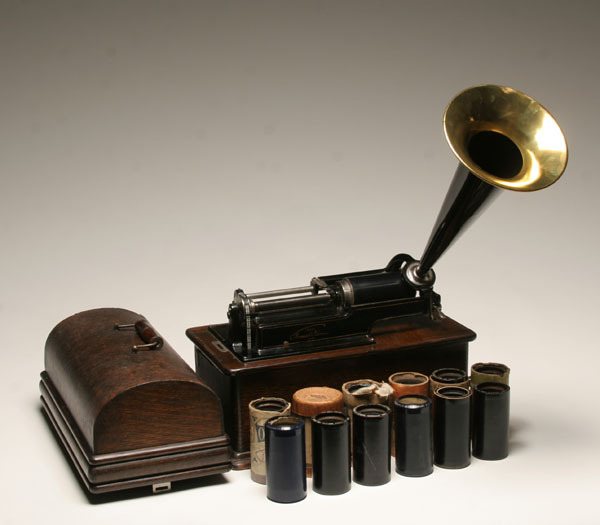 Columbia Phonograph Company produced 60 cylinders of recordings of the Marine Band conducted by Sousa making them some of the first recording "stars". 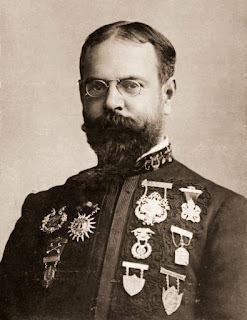 Sousa left the military in 1892 because he wanted to pursue a more lucrative career as the leader of his own band. He conducted a farewell concert at the White House on July 30, 1892 and was discharged from the Marine Corps the next day. He organized his own Sousa Band which toured from 1892 until 1931. They performed 15, 623 concerts in America and around the world. He aided in the development of a new tuba like instrument that came to be know as the Sousaphone. "These talking machines are going to ruin the artistic development of music in this country. When I was a boy ...in front of every house in the summer evenings, you would find young people together singing the songs of the day or old songs. Today you hear these infernal machines going night and day. We will not have a vocal cord left. The vocal chord will be eliminated by a process of evolution, as was the tail of man when he came from the ape." During that time, he continued to compose marches among them being my personal favorite. Whenever I hear a band playing this song I can't help but want to jump to my feet, wave the flag, and join the parade! Or maybe jump on a brightly colored Carousel horse and plunge forward into the breach! He had many interests and talents outside of composing and directing. He wrote a novel called THE FIFTH STRING, a book titled PIPETOWN SANDY, and a story named THE TRANSIT OF VENUS. He also wrote a booklet A MANUAL FOR TRUMPET AND DRUM published by the Ludwig drum company. An early version of the trumpet solo to SEMPER FIDELIS was printed in the book. He was one of the greats of trapshooting and is in the Trapshooting Hall of Fame. He started the first national trapshooting organization and wrote many articles about the subject. He competed regularly representing the US Navy usually against the US Army registering over 35,000 targets during his shooting career. The other night I was watching PBS's HISTORY DETECTIVES (you can watch this episode on the HISTORY DETECTIVES website) and learned something I had never even imagined. This lady had a handwritten sheet music of THE STAR SPANGLED BANNER that had been given to her grandfather by his music teacher, a man named Arnold Gantvoort. At the top of the page was written five names: Arnold Gantvoort, William Earhart, Walter Damrosh, Theodore Sonneck. and JOHN PHILLIP SOUSA. The lady investigator from the show traced the history of the document and found something very interesting (at least to a history buff and Sousa fan like me)! Francis Scott Key didn't know anything about music and had written just a poem during the War of 1812. People began singing the words to the tune of an old British drinking song. In fact, at least two tunes were used over the years. Fast forward to 1917. There was a push in Washington to make THE STAR SPANGLED BANNER the National Anthem of the United States (though Congress didn't actually vote on it until 1931). A committee was set up consisting of two music educators, two famous composers and conductors, and the head of the Library of Congress Music Division. These five men, which included Sousa, wrote the arrangement we sing today! They had a hard time deciding where to go with it (and left the note written in pencil on the manuscript) but they are responsible for the high note on the word FREEEEE! That same year, the United States entered World War I. Although he was already 62, the mandatory retirement age for Naval officers, Sousa was commissioned as a second lieutenant in the United States Naval Reserve. During the war, he led the Navy Band at the Great Lakes Naval Station near Chicago. He did not need the money so most of his salary was donated to the Sailor's and Marines' Relief Fund. For his service he was given the World War I Victory Medal and elected as a Veteran Companion of the Military Order of Foreign Wars. He was discharged from active duty in November of 1918. He went back to conducting his own band and never returned to active duty even though he was promoted to lieutenant commander in the early 1920s. He continued to wear his naval uniform for many of his concerts and public appearances. Sousa received many awards and honors during his lifetime and continued to do so in later years. He was given the palms of the Order of Public Instruction of Portugal and received the Royal Victorian Medal from King Edward VII. A ship was named for him during World War II, the Liberty ship SS John Phillip Sousa. The Marine Band continues to use that ship's bell in their concerts. He was inducted into the Hall of Fame for Great Americans in 1976 and the Classical Music Hall of Fame in 1998. The band hall for the Marine Band is dedicated to him as the JOHN PHILLIP SOUSA BAND HALL. In 1987, Congress named THE STARS AND STRIPES FOREVER as the National March of the United States. The man even has a star on the HOLLYWOOD WALK OF FAME! John Phillip Sousa died of heart failure at the age of 77 on March 6, 1932 in his room at the Abraham Lincoln Hotel in Reading, Pennsylvania. The previous day he had conducted a rehearsal of STARS AND STRIPES FOREVER with the Ringgold Band. He is buried along with his family in Washington, D.C.'s Congressional Cemetery. His legacy is kept alive by The John Phillip Sousa Foundation. The Foundation provides scholarships and awards to outstanding young marching band students who show musicianship, dependability, loyalty, and cooperation. And so my children, now you know why that crusty old band teacher INSISTS you learn at least a few of this old dead guy's songs. He was the MARCH KING (but so much more) and always will be!